This pattern uses 2 1/2 inch strips to make blocks. The used jelly rolls for the quilt in the book, but I used strips I cut myself from donated fabrics and fabrics from my own stash. Some of my fabric was scraps from making dog bandanas and that was really scrappy! I followed the directions for the quilt in the book, but you could cut the 2 1/2 inch strips any length you like and also choose a different number of strips in each block. It’s a straight forward design, but I think it will be a fun Charity Christmas quilt when it’s all put together. 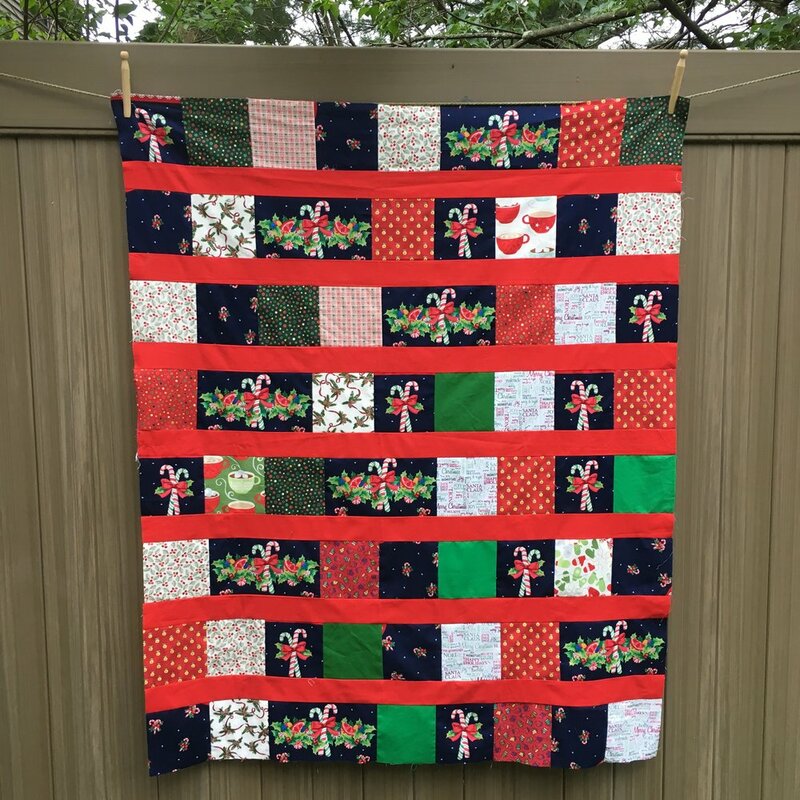 The pre-cut Charity Quilt project I discussed in the last 2 posts was so much fun that I pulled out my stash of Christmas fabrics to make a another quilt. 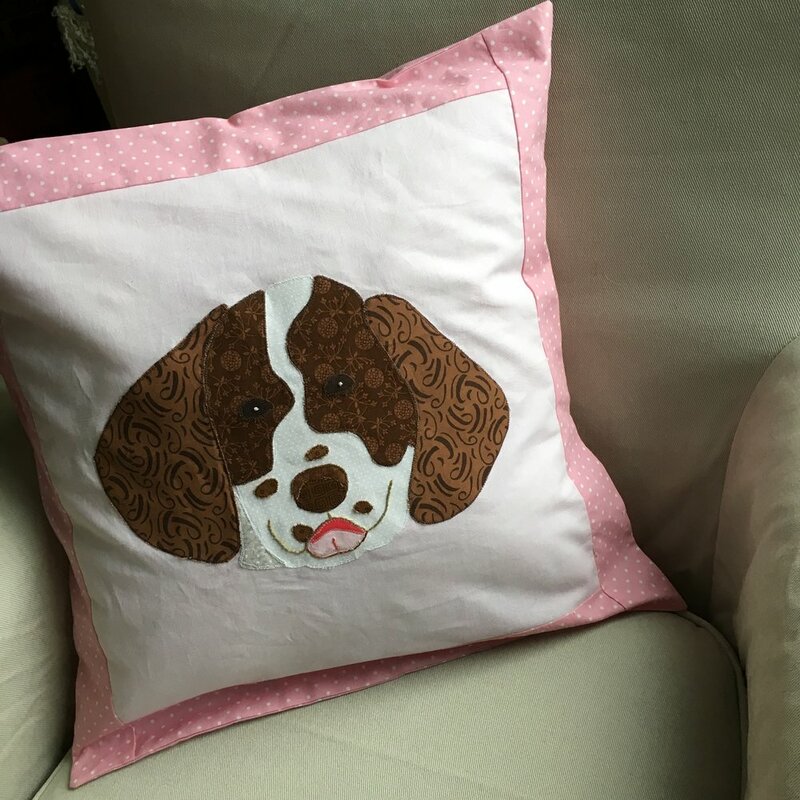 I made this one for my dog* but it will be an example to show at the Guild meeting when there is a discussion about ways to use the fabrics that were pre-cut this past summer. This quilt was made with just 10 x 5 inch bricks and 5 inch squares. There are an equal number of each block in each row. There is a narrow strip of fabric at each end of the quilt to give it some definition. 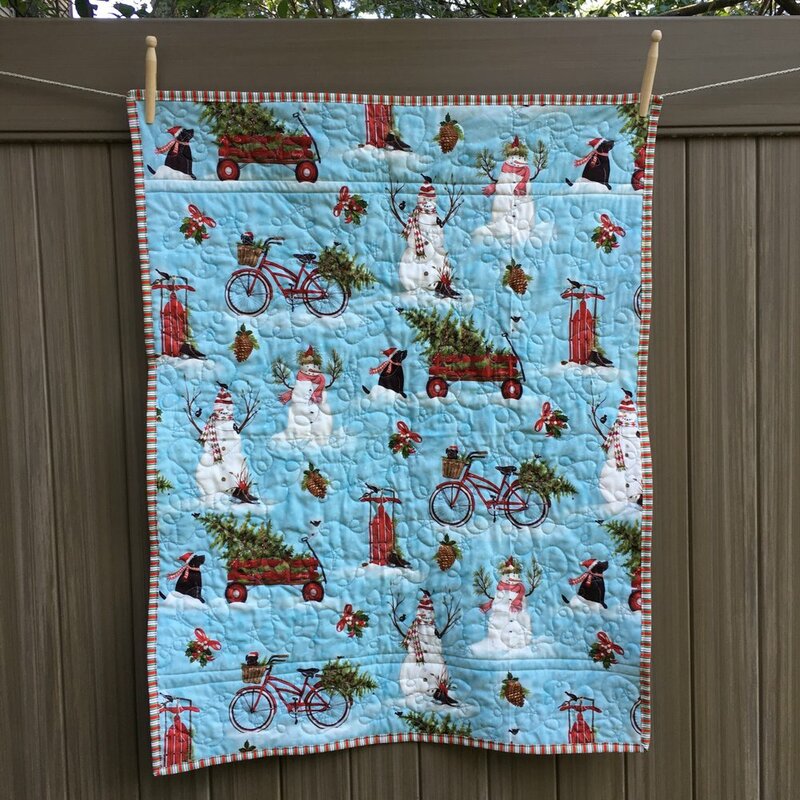 The back has a large print Christmas pattern, so this quilt is actually reversible. 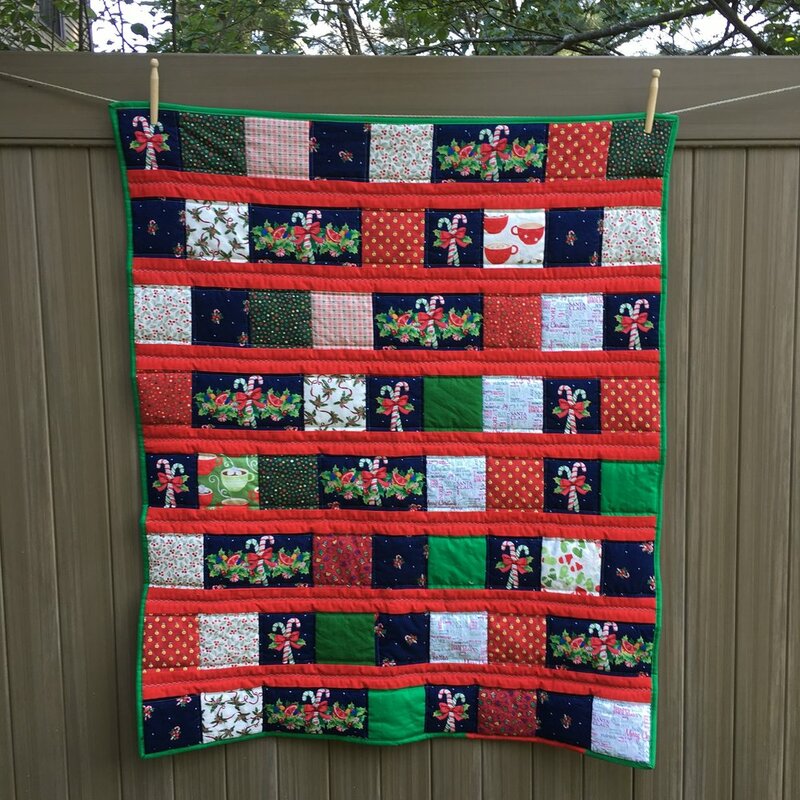 *The Christmas quilt I use on my bed has a red Irish Chain with white blocks. I'm going to put this quilt son top of that quilt for my quilt-loving Lab-mix to sleep on! Hopefully this little quilt will keep my quilt clean! 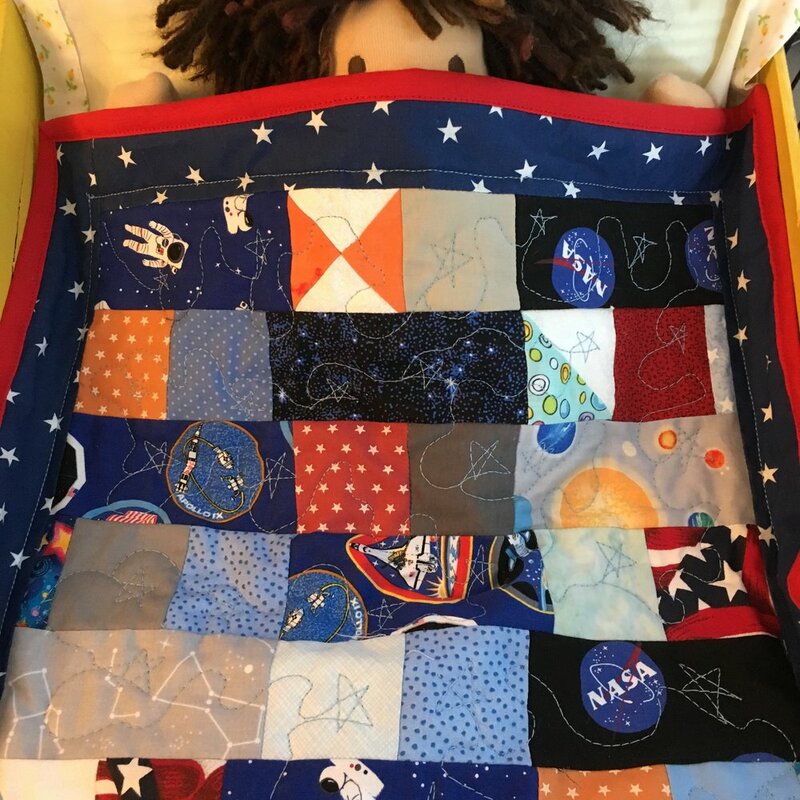 On a roll, I made one more quilt--this one doll size. 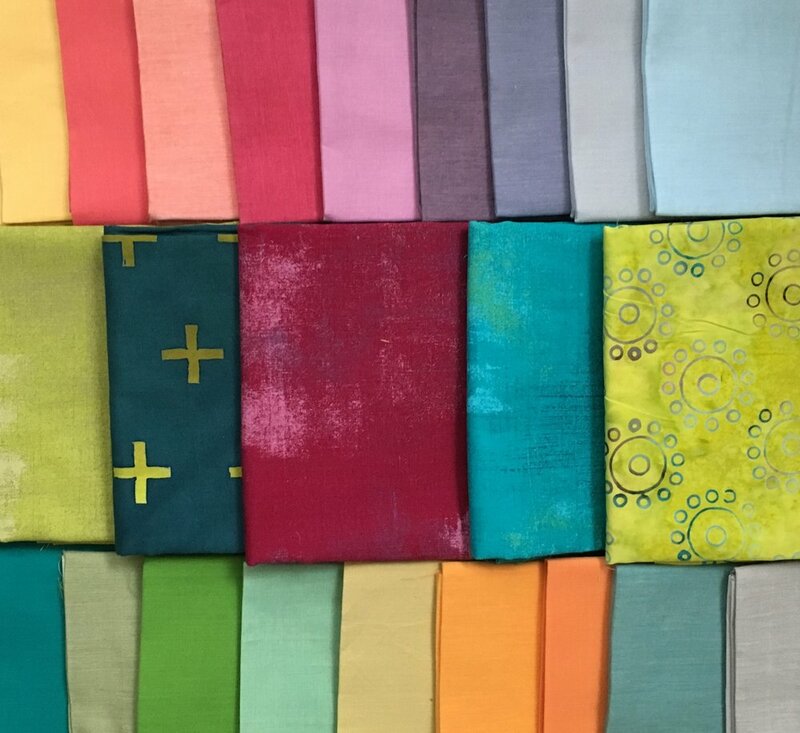 An Etsy company sent me four 5 inch charm squares of space fabrics as a bonus to my fabric order. Making a doll quilt seemed like a perfect way to use those squares plus some of the bits and pieces in my stash. I decided to cut the 5 inch space fabric squares in half and use 2.5 inch squares from my stash. Good thought but....what works in algebra doesn't work in quilty math! I didn't put 2 and 2 together until I had sewn all the strips of blocks for the quilt long to discover that they weren't the same length. Right: in quilting a 2.5 square + 2.5 square = 4.25 x 2.5 block, not a 5 x 2.5 inch block! It was too late to cut down the 2.5 x 5 inch blocks so I just added a bit of fabric on alternating ends of each row, making it a scrappy improv Space quilt. Problem solved, but I did have a good laugh....How long have I been quilting??? Long enough, but even an experienced quilter can get tripped up by not checking the math before cutting! Even though I've drafted patterns for my own Waldorf type dolls, I particularly enjoy using the patterns for the traditional Waldorf Type Dolls in Mariecristin's book, Making Waldorf Dolls. There is a lot of hand sewing in the assembly of these patterns. That may be why I enjoy making them. There is no need to try to get the joint of an already-stuffed arm or leg to run though the sewing machine. That's always been my nemesis with my own patterns!! I made both dolls on this page, using the pattern for the middle size doll in the book. Mine come out to be 12 inches tall. I've shortened the arm length in the pattern because I think the pattern arms seem a bit long. 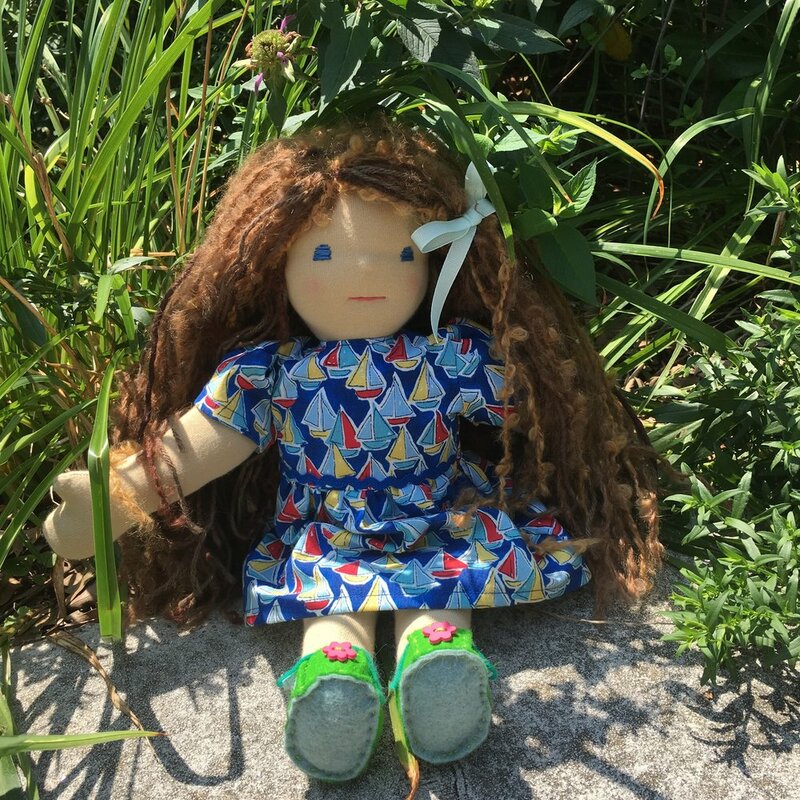 Josie, a doll made with fair skin, is shown above. She has three different types of (mostly) pink hand spun yarn (purchased at JP Knit & Stitch, my local yarn/fabric shop) in her brown hair. I made the other doll at a request of a friend. She wanted a doll for a child who has mixed Hispanic and Oriental heritage. I had some beige De Witte doll jersey which was just the perfect skin tone for this doll. I was so glad had some on hand since it's not a color I typically use. Her hair has three types of black yarn and a couple colors of dark brown yarns as accents. I had so much fun making this doll and I just love how she turned out! Here is a bunny hiding in the tulips in the dress on the left. Can you see? It's (finally) done: My 2017 year-long Scrappy Block Project! Every month last year I sewed 2-3 improv blocks from two bags of odd scraps I had collected. At the end of the year I had 30 blocks that were 12 1/2 inches square. I set the improv blocks between rows of blue and white blocks which were "orphans" from another quilt which I never made. The result is a bit wacky, but this is a quilt that is going to be used and definitely not too precious for the dogs for the dogs to sleep on it!! 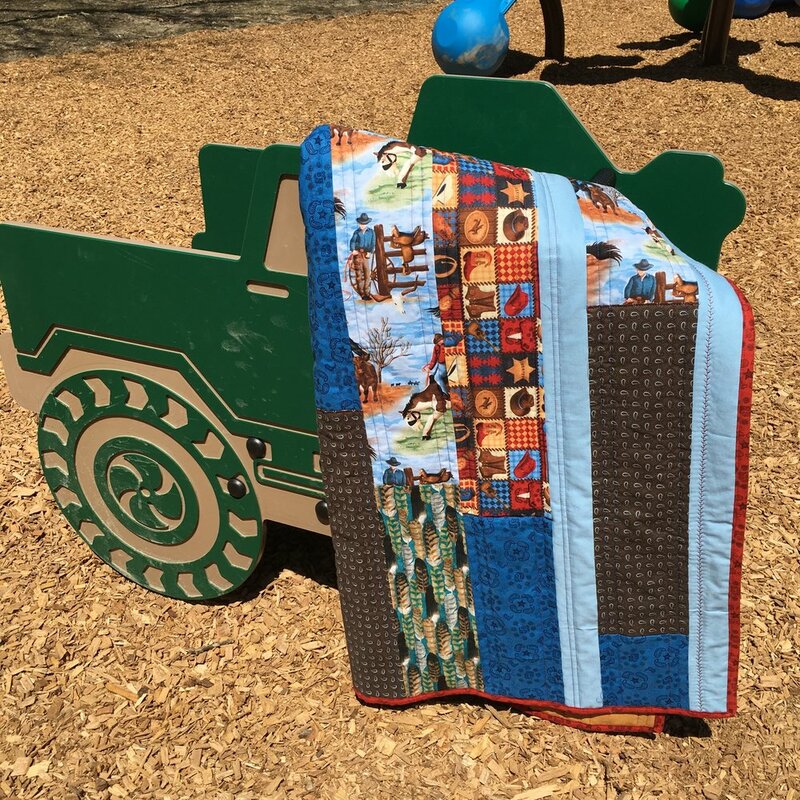 The quilting is as improvisational as the blocks themselves! I took my clues for the quilting from the composition and the fabrics in each block. 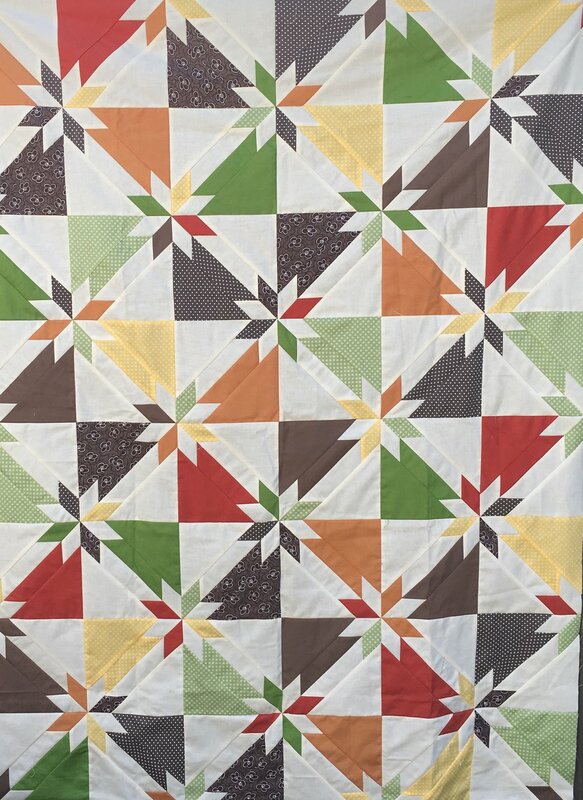 The quilting is a mix of straight line walking foot stitching and free motion quilting. It seemed to take forever!! But I had a good laugh when I was done and put it on a bed....I'd forgotten how big this quilt is! I had thought I was quilting a twin size quilt, when reality it's a good size queen! No wonder the quilting seemed never ending!! Here are a couple of close-ups of the free-motion quilting in this project. "Plus Surround" Quilt 65 inches square, with my Springer Spaniel photo-bombing the shot! This is my completed "Plus Surround" quilt from the book, Modern Plus Sign Quilts. 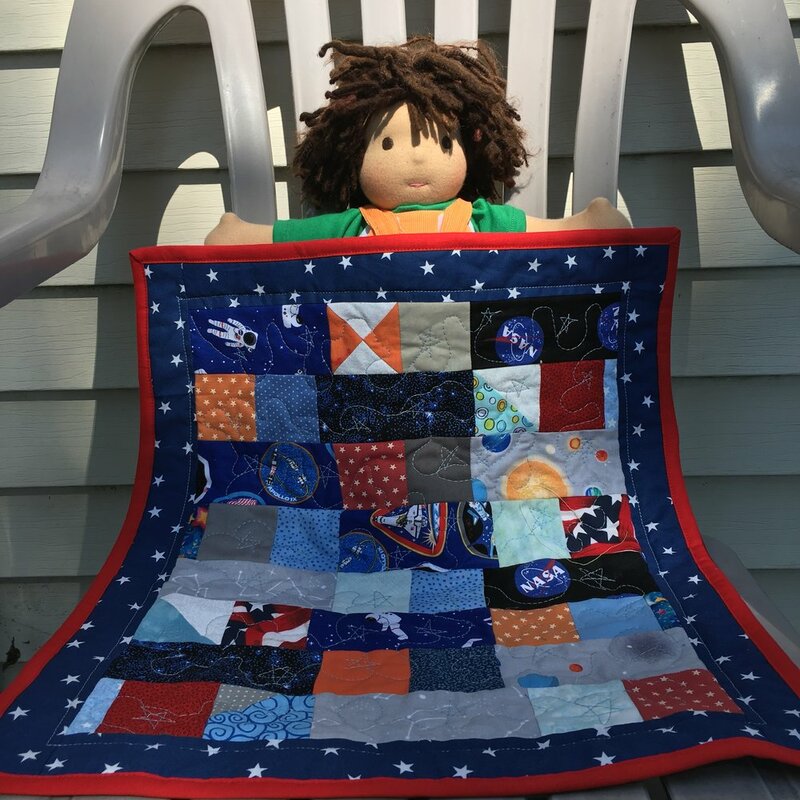 There is review of the book on my March 29, 2018 blog post and discussion about making the quilt on the two subsequent posts. There is straight line quilting on each of the plus signs which I really like. But I really struggled with how to quilt all of the negative space in this quilt (the yellow background). The quilt in the book has quilting radiating from the center of the quilt. I knew I didn't want to try to copy that. Because of the circular design, I decided to quilt the negative space with free motion circular loops. About half way done, I wished I'd done a misty soft linear/loopy fog-like design instead. But it was way to late to do that! The circular loops feel a bit too traditional for my taste, but it's growing on me! What's the best thing about this quilt? The great design of this quilt. It captures the viewer's attention! And here it is: The quilt I designed for my Yankee Swap Fabrics (see May 31, 2018 post) using the Custom Set Blocks option in the Electric Quilt (EQ8) program. The design is a combination of flying geese, economy blocks in 2 sizes and an assortment of rectangles and squares. The blocks sizes can all be divided by 4. That common denominator makes the blocks in the quilt all compatible and allows for piecing without odd seams. It is important to check the design to make it actually can be pieced!! It is possible to design a quilt that is essentially impossible, or would be a nightmare, to piece! 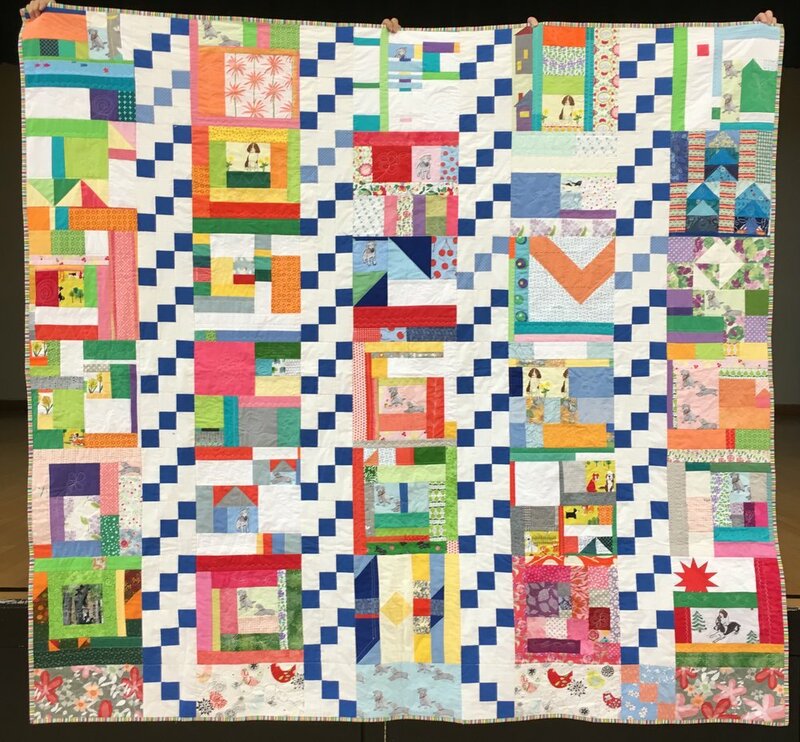 The central panel of this quilt can be pieced in 4 strips--two wide ones and two narrow ones. Can you see how looking at the pattern? * The flying geese borders will be pieced and added after the central panel has been pieced. I moved a number of blocks around as I was designing the quilt. I found I could move one block off the work area, shift another block into that space and then move the first block back into the newly open space. It reminded me of those little plastic puzzles I had as a child where you move pieces around in a plastic square to put them into some sort of order to to spell words! In the example below, I want to swap the location of the teal and gold rectangular blocks in the right side of the middle row. I lifted the teal block out of the quilt, moved over the gold block to the left and put the teal block in the place where the gold block had been originally. How cool is that? (I could also have just recolored them, but I wanted to show that you really can move blocks around very easily in this program). The colors of the actual quilt won't be exactly the same as the colors in this pattern. But they are close enough so that I know I'll like the design and color distribution. Time to cut and start sewing! * (The top and bottom strips are the wide ones). 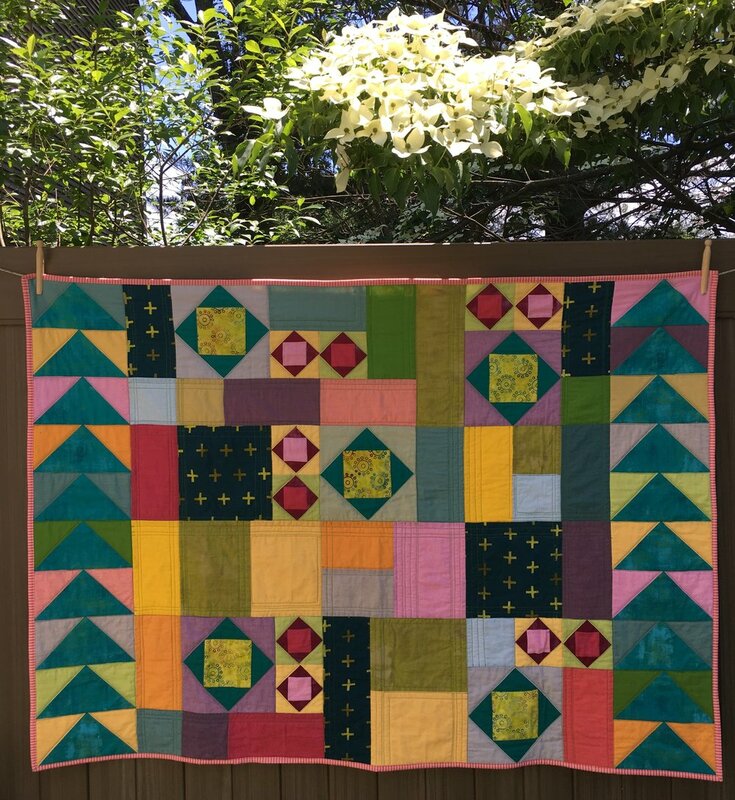 Addendum: I just realized today, June 22, 2018, that this quilt design was obviously inspired by a quilt designed by Sam Hunter. For details, see the addendum at the end of my next post, "Flying Economy" Finished Quilt.